""Mother Nature is very resilient": A year after Hurricane Harvey, coastal ecosystems are thriving" was first published by The Texas Tribune, a nonprofit, nonpartisan media organization that informs Texans — and engages with them — about public policy, politics, government and statewide issues. "Mother Nature is very resilient": A year after Hurricane Harvey, coastal ecosystems are thriving By Natalia Alamdari August 15, 2018 CORPUS CHRISTI — When Larry McKinney steers his boat around the bays near Corpus Christi, he’s normally able to navigate by sight. But since Hurricane Harvey made landfall a year ago, dumping anywhere from 20 to 50 inches of rainwater along the Texas coast, McKinney’s usual markers aren’t as recognizable. “Some of the islands that you used for landmarks have disappeared or been reconfigured,” said McKinney, executive director of the Harte Research Institute for Gulf of Mexico Studies. “The natural infrastructure has changed, and the system’s adapted to that.” In the year since Harvey, McKinney and his colleagues at the Texas A&M; Corpus Christi interdisciplinary institute continue to research how both humans and nature reacted and adapted to the storm. The storm — which caused nearly $125 billion in damage and led to the deaths of an estimated 94 Texans — tore apart human communities. Still, McKinney said, Harvey serves as a reminder of the resiliency of nature and how coastal bays and estuaries have evolved to benefit from seasonal storms. For coastal ecosystems, Harvey offered a welcome and necessary flush of freshwater to bays and estuaries. The rainfall was like stirring up a big pot, McKinney said, freeing sediment and nutrients that had been trapped in riverbeds and letting nutrient-rich waters flow to the coast. “That all washes down into the estuary and provides the very base of the food chain,” McKinney said. “The more nutrients that come in, the better for the estuary. When you have a really massive flood, particularly when there’s been a drought before, you get an overabundance.” In the immediate aftermath of the storm, that overabundance did cause a plankton bloom — or a sudden high concentration of plankton in the ecosystem. As those plankton die, their decomposing bodies use up valuable oxygen in the estuary ecosystem. But now, McKinney said, the nutrients remaining after the plankton bloom are fueling fish and other small creature populations. "Over the years, those [canals] will get a big production of trout, which is great for fishing over the next few years," McKinney said. Beaches and plant life were also rejuvenated in the aftermath of the storm, said Tom Schmid, CEO of the Texas State Aquarium. McKinney said that when it comes to hurricane recovery, “it’s really interesting how much better the actual marine ecosystem is at recovering than the human side,” McKinney said. “If we didn’t have hurricanes, this coast would look very different. 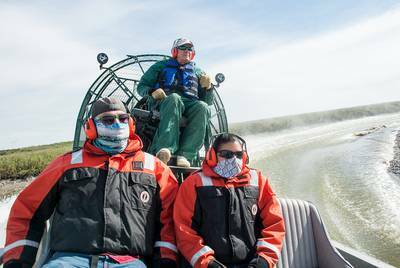 But the system has changed in a way that reflects that.” Researchers from the Harte Research Institute for Gulf of Mexico Studies travel by airboat to take water samples of the Nueces River near Corpus Christi. Courtesy Texas A&M-Corpus; Christi That quick recovery along the Gulf Coast makes sense, McKinney said, and was in line with scientists’ expectations. Maps known as "spaghetti models" that plot the paths of past hurricanes show that tropical storms are frequent in — and affect every part of — the gulf. “Think of our coastal ecosystems,” McKinney said. “It has infrastructure just like our coastal communities. When hurricanes hit and you get flooding canals and houses, the same thing happens to the natural community. It’s just that the natural system is much better than humans at recovering from those impacts and moving on.” But while Harvey's freshwater rejuvenated ecosystems in the lower coast, the heavy rainfall was too much to handle as the storm traveled — and stayed put — farther up the Coastal Bend. As the hurricane stalled out over Houston, it dumped enough freshwater at once into the Gulf to become toxic. Through models and satellite images, scientists were able to watch the mass of freshwater as it spread more than 100 miles offshore. Even by November, the "blob" of freshwater had yet to be absorbed into the sea. Freshwater is less dense than saltwater, so it floats on the ocean's surface, McKinney said. A layer of freshwater creates a dead zone, cutting off oxygen from the atmosphere from reaching the saltwater — and marine life — below. While scientists did see some bleached coral and decreased salinity levels near the Flower Garden Banks, a coral reef about 100 miles off the coast, the situation would have been much worse had the fresh water body passed directly over the reef. "The Flower Gardens act like a sentinel," McKinney said. "They're so far off that they're generally unaffected. When something happens to [that coral], then it must really be a serious issue." Researchers with the institute also received more than $300,000 from the National Science Foundation to continue work on how ecosystems bounced back from the storm. Studies include a look at how Harvey impacted lagoons along the coast, as well as how flooding and fallen trees affected streams and rivers. The two research teams were among 59 across the country given grants to study the immediate impacts of the storm. “Mother Nature is very resilient,” Schmid said. “The barrier islands will always be there. They might shift a little bit, but when we build things on them, that’s where it gets compromised. I think animals have an amazing ability to recover from events like this. We seem to take a little bit longer sometimes.” Read related Tribune coverage Gulf Coast mayors discuss the impact of Hurricane Harvey Southeast Texans should watch out for wildlife while clearing Harvey debris Here’s how much rain Harvey has dropped on Texas ""Mother Nature is very resilient": A year after Hurricane Harvey, coastal ecosystems are thriving" was first published at by The Texas Tribune, a nonprofit, nonpartisan media organization that informs Texans — and engages with them — about public policy, politics, government and statewide issues. Link back to the original article, which is located at https://www.texastribune.org/2018/08/15/year-after-harvey-scientists-continue-study-its-environmental-effects/.